Junior Grange provides an opportunity for children ages 5-14 to develop self-confidence, leadership skills, while fostering the traits of accountability, responsibility and respect for self and other. The Junior Grange also encourages honor, an understanding of agriculture and an opportunity to improve the communities where the children live and play. The Merit Badge program is a leadership development tool which uses clearly defined objectives to allow Junior Grange members to explore their world. This process includes development in critical thinking skills, educational opportunities, and presentation skills. All of which are necessary to develop leaders in today’s society. 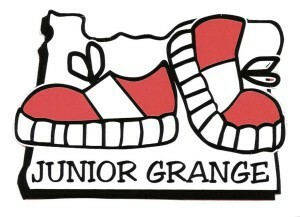 There is one additional element that must be included in any Junior Grange program - - FUN!!! It is fun to learn new things, watch new ideas grow and most of all be involved in the process. Each year we will choose a large on going project which will benefit our community. Each child will have an opportunity to share ideas, lead a sub-committee of peers, be a team member to support each other in their goals. Children will learn what it means to respectfully communicate with other people and how to draw healthy boundaries for themselves as well as respect others' boundaries. At each meeting we will have a topic of discussion and a hands on craft. There are classes and adventures offered free to Junior Grange members and at low cost for children who are non-grange members if they would like to bring a friend who is not a part of the grange.